I love wide open spaces. It was on a cross country drive a number of years ago that I realized how much I love wide open spaces. The Canadian prairies are, for some, monotonous and boring but I loved the days of driving over rolling hills through wheat fields and grassland because I could see forever. Jordan is fabulous for being able to see forever. The drive down the King’s Highway was a stunning display of desert scenery interrupted only by massive canyons that I did not know could exist in a desert landscape. Some people see this area on a cycling holiday; it would be amazing to move through this scenery by my own power, but not this time. 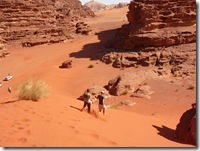 Wadi Rum is the most famous desert landscape in Jordan. 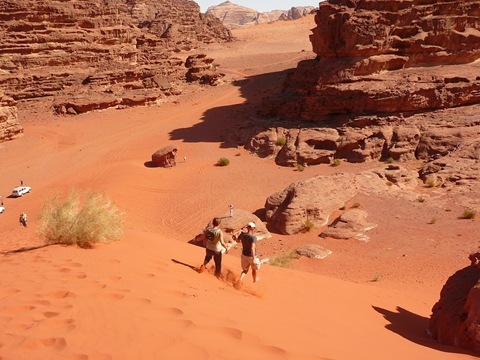 It is here that Lawrence of Arabia came into being – the man, the book, and the film, and it is here that we explored the desert by camel, by jeep and on foot. Yes, by camel! For the first part of the tour we climbed up onto camels to be led into the desert. 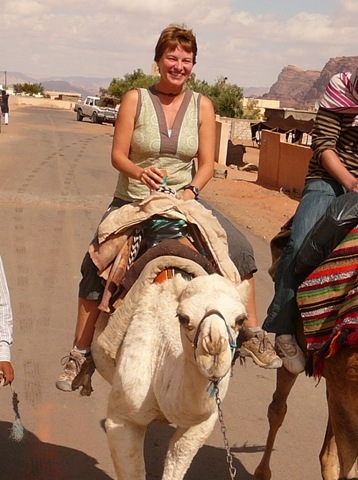 Although large and tall, camels are very gentle and riding one was much smoother than riding a horse. They just plod along, their enormous feet barely making a mark in the soft sand. It was fun but I’m glad it was only 1/2 hour or so…the pace was a little on the slow side for me. The ‘jeep’ was an ancient LandCruiser type vehicle with no wipers or window handles and our driver, Ali, kept poking his head out the window to look back at something…we checked later to realize that the rear wheel was missing a couple of bolts…I guess he was checking to see if the wheel was still on!! The jeep tour was the antithesis of the camel tour. The camels may have been slow and plodding but the jeep was anything but. Ali knew Wadi Rum like the back of his hand and we raced over the sand and around the imposing rock formations to see all the sites. 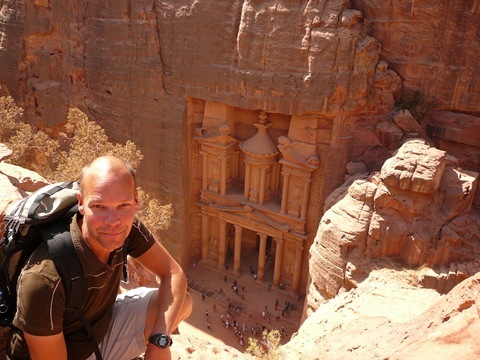 I’m sure there are important historical, religious and cultural sites within Wadi Rum but, for me, the highlights were climbing up a great red, red, red sand dune…and then running down in great, giant leaps, scrambling up to the top of the rock ‘bridges’, and making lunch over a small fire in the middle of the desert. It was a great day of touring, topped off by a night in a desert Bedouin camp. The weather did not cooperate though and the starry, starry sky I had been wanting was masked by the clouds of an impending storm. 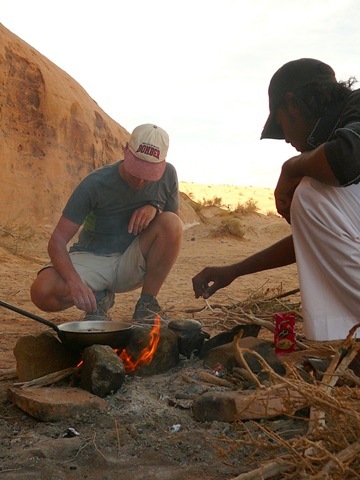 It was fun though to sit around the campfire and chat with the Bedouins and other travelers. From Wadi Rum we headed south to Aqaba on the Red Sea, where Jordan meets up with Israel, Egypt and Saudi Arabia. Here, again, are many important religious sites…but we came for the snorkeling – it is supposed to be some of the best snorkeling in the world here…and it didn’t disappoint. It was like being in a giant aquarium, or the ‘Finding Nemo’ movie. The water was a fabulous aquamarine color, visibility was amazing and there were fish everywhere. Blue fish, green fish, yellow fish, blue and green fish, yellow and red fish, big fish, small fish, fat fish, thin fish…an amazing variety of shapes, sizes and brilliant colors set in a backdrop of colorful coral in water so shallow that it would be possible to touch everything. It was amazing and we spent hours floating and watching. Our next stop was the Dead Sea. It is the lowest point on earth (418M below sea level) and one of the saltiest pieces of water on earth. There isn’t much there except for some potash industry and a string of luxury spa hotels, but we couldn’t miss the chance to bob around in the water like a cork. The water felt a little slimy with all the salt. A teeny tiny splash got into my mouth…it was disgusting and almost felt a little like a chemical burn. But boy is it floaty…sticking arms and legs out of the water was easy…swimming was not – I kept flipping over when I tried. 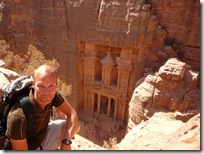 It was a short, 10 day, visit to Jordan…but it’s a small country and we saw everything we wanted to. I’m glad we added it to our itinerary – it would have been a shame to miss the amazing sites and stunning scenery. This post is hard to write…because I am speechless. 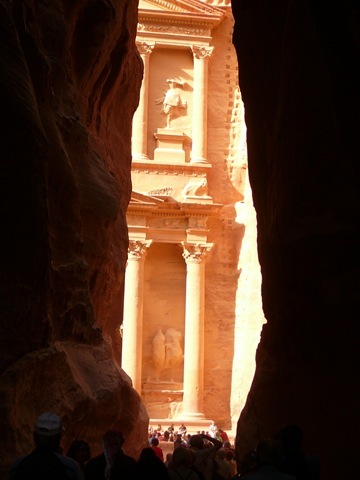 Petra is absolutely, breathtakingly, stunning. It is beyond words. The natural scenery is beautiful and indescribable…and then the carving on top of it all…amazing!! The approach to the famed Treasury building has got to be one of the best reveals on the planet. First we walk along a wide valley on a non-descript gravel path past red rocks with some niches and square blocks carved out. Then we enter what is called ‘The Siq’…a fault line in a red sandstone mountain that opened up millennia ago forming a narrow twisting gorge with high, high walls that have been smoothed over time by both wind and water. I can see how the walls were once formed together – a niche here matching an outcropping there…some closer together than others as the width of the Siq ebbs and flows. The colors are red and pink and yellow and brown and layered and suffused together everywhere. The sky above contrasts blue, blue, blue and the sun shines down creating shadows and ripples throughout. We crane our necks gazing upwards at the natural beauty, but are quickly reminded to also watch underfoot to avoid spraining an ankle on the uneven, cobbled, paving stones that line the walkway – a quick reminder that we are also here to see what the Nabatean culture left behind from the first century B.C. Soon, evidence of carving starts to appear on the Siq walls. Small niches are carved, a shrine can be seen and, a little further on, the large remains of two figures leading camels can be discerned also. I saw almost none of this. I was so in awe of the Siq itself and so excited to see the Treasury that I could not focus on anything else. I kept peering around every corner, unable to wait for the first glimpse. I was so excited I thought I would blow up. And then, suddenly, it came into view. The pictures of the Treasury are iconic, but the reality is truly breathtaking…tears stung my eyes as I gazed at the magnificence of the artistry and craftsmanship. This has never happened to me before..I was absolutely awe-struck by the imagery. The whole of Petra is like this. We walked around the massive site for seven hours the first day (upwards of 25KM we estimated we walked) shaking our heads in awe at the amazing buildings, tombs and shrines that are carved in the rock faces. How a society from so long ago managed to carve such structures is unimaginable to me. The second day we hiked into the site along an alternate route. Bypassing the Siq, we hiked up the almost deserted Wadi Muthlim route. 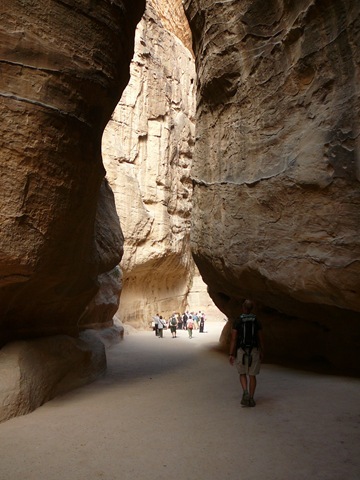 It followed another, narrower gorge that lacked the carvings of the Siq and the rest of Petra but was naturally stunning. The guidebooks warn not to take this route during rainy season due to the danger of flash floods and the guards were hesitant to let us through that day as it was cloudy and there was threat of rain but we were persistent and gained entry. It soon became apparent as to why there was concern. The gorge walls quickly rose and closed in forming a chute of sorts that would channel water very efficiently. There was evidence of water all around, from the riverbed like surface of the walkway to the water eroded sediment on the sides and, in the narrowest of places, we could see a soil, tree and debris plug high up in canyon…water had obviously rushed through here more than once and caused catastrophic damage. The skies were clearing though and we felt safe enough to continue. The hike was amazing. The rock faces were brilliantly colored and shaped by water and wind to incredible shapes. The gorge opened up and narrowed again a number of times and, at the very end, it became extremely narrow and twisty and curvy necessitating some scrambling and climbing to reach the end. Very cool. 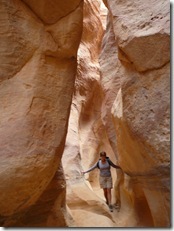 As we exited the narrow gorge we found ourselves in a wide rocky valley with a small Bedouin camp at the entrance. Two children, Rasheed (9) and Haman (6), quickly attached themselves to us and proclaimed themselves our guide back to Petra. Although barefoot and a little shabby looking,they were funny and enjoyable and so we walked together chatting and racing and holding hands for the half hour walk back. Rasheed explained that her mom was working at Petra (many Bedouin woman have ‘jewelry’ stalls in the site) and that we should come for tea. We arrived at the stall and greeted her mom before being led to some straw mats to sit on. Her mom went off and I wondered where she had gone before I saw her in the distance gathering branches to make a small fire. She returned shortly and set to making the tea. While the tea was brewing we were more than entertained by Rasheed’s younger brothers and sisters (4 in total) as they tried on our hats, carried our packs around and climbed all over us as if we were new toys. We enjoyed our tea chatting, as best we could, to Rasheeds mother and watching the kids do what kids do…chase each other around, wrestling and playing until one of them starts crying. It was fun and interesting – I wish we had some pictures but it just didn’t feel right to bring out the camera and so we will just remember it in our heads. It is often difficult for a place to live up to expectations, especially in this age with so many images and stories already existing, but Petra more than lived up to my expectations. 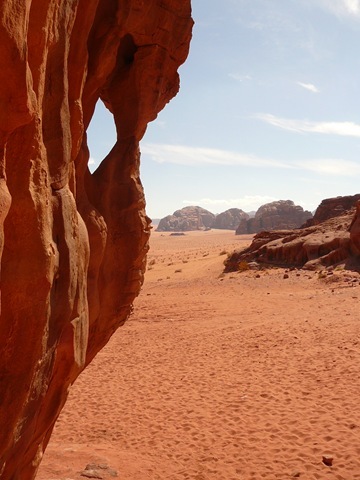 It, alone, has made adding Jordan to our itinerary worth it…and we haven’t even hit the desert and the Dead Sea yet.